Powered by 3100 watts, our Powersteam Ultra iron heats up 15% faster* and irons 50% more smoothly** so you can get the job done quicker. It has a super smooth ceramic soleplate that glides through even the toughest creases to leave your garments wrinkle-free. A tapered tip with button grooves lets you get into those awkward bits of fabric around fastenings to give your clothes a professionally ironed finish. The Powersteam Ultra has features such as a large 350ml water tank that will deliver a powerful 210g burst of steam to get to grips with creases in denim or linen; and a 45g continuous shot of steam to tackle cotton clothing. It has a powerful vertical steam function that’s ideal for getting the wrinkles out of hanging garments, curtains and upholstery. Whether you enjoy ironing or you hate it, you’ll love the fresh pressed results from the Powersteam Ultra. Our highest wattage iron ever! 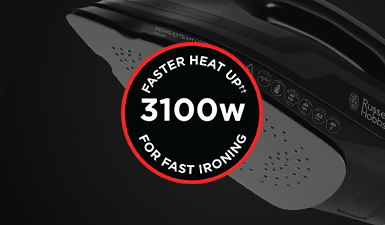 3100W of total power for 15%* faster ironing. 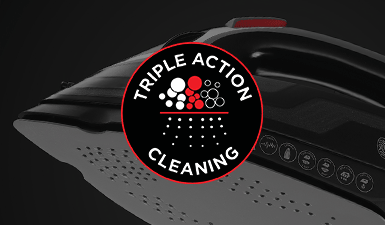 This iron is equipped with an anti-scale cartridge and self clean and power shot functions. These help prevent the build up of scale and prolong the performance and life of the iron.